The most important aspect of safety in Light Water Reactors is the cooling system. The coioling system also serves te purpose of moderating the nuclear reaction in Light water reactors. As we have noted, a loss of coolant in Light Water Reactors will stop the chain reaction, but will lead to core overheating because of the continued core heating caused by the radioactive decay of fission products. For that reason it is vital to maintain the presence of cooling water in the reactor core. There is one major variation in the LWR cooling system. Pressurized Water Reactors use secondary coolant systems. The secondary coolant system, in the PWR is responsible for stem generation. Water at high temperature and under heavy pressure leaves the reactor core and flows through pips to a steam generator. In the steam generator the water from the reactor passes through a heat exchange where is passes heat to the secondary coolant water. The primary coolant water then pumped back into the reactor, where it begins the cycle again. The secondary coolant water, once it has entered the heat exchange begins to rapidly boil. The steam is then routed to steam turbines where power is produced. Upon exiting the turbine the steam is cooled and condensed, and returned to the secondary coolant system. The Boiling Water Reactor only has a primary coolant system. Water, under somewhat lower pressure in a BWR turns to steam in a BWR. the steam then flows to the turbines, the spent steam is cooled and condensed, and the cooled water is returned to the reactor where the cycle begins again. The coolant system of the BWR is simpler, and simplicity often enhances safety. Hence the BWR is potentially very safe, but at a price of somewhat lower efficiency. Coolant systems usually rely on pumps to move water around, and like any other mechanical objct pumps do break down. They have to be periodically serviced, and in addition have been known to fai lin the course of reactor operations. There is a work around for pump servicing and pump failure, and that is back up coolant systems, that can be either automatically brought into operation in the event of pump failure, or when the pump of the primary coolant system is being serviced. One of the major contributing factors to the Three Mile Island Accident was the failure of the secondary coolant system, due to the tripping of a water pump. The backup pumps had been accidentally locked off line, so the essentially the primary coolant system lost its ability to dump heat from the reactor core. The reactor shut down, and other systems to maintain core safety automatically came into play. At that point the accident would have been over, had not an operator not shut down the emergency coolant system. Thus the Three Mile Island accident illustrates the successful function of the defense in depth philosophy. Because even though secondary coolant system failed, and its backup was off line, and the the emergency coolant system was turned off, and the reactor core suffered partial meltdown, defense against a major release of radioactive material held. The cost of the coolant system failures was however, major damage to the reactor core. Since the Three Mile Island accident illustrated the vulnerability of LWRs to coolant system failure, much attention has been paid both by reactor manufacturers and the Nuclear Regulatory commission of the United States to the improvement of the safety and reliability of Light Water Reactor coolant systems. One major approach for improvement has been the replacement of pumps with thermal syphons. Thermal syphoning is not exactly high tecnology. The principle was sucessfully used to circulate engine coolant in the Model T Ford! A thermal syphon takes advantage of the natural tendency of heated liquid to rise in a liquid column, while cooled fluid falls. In a closed system where the liquid is both heated - for example in the engine of a Model T Ford - and cooled - in the radiator of the Model T Ford - the coolant may achieve natural circulation without mechanical pumps. Remarkably, the same thermal syphon principle which works with antique cars, also works for the latest models of very large reactors. One notable example of this is the Evolutionary Simplified Boiling Water Reactor (ESBWR), which has is the Latest Word in Generation III + reactor safety. Because the ESBWR dispenses with cool water pumps, it also eliminates the very possibility of pump related accidents. A second feature which the ESBWR has in common with other Generation III+ reactors is the use of gravity feed emergency water systems. These systems place large tanks of emergency cooling water above the reactor core. In the event of a loss of coolant accident, water from the emergency coolant tank will automatically flood the reactor core. The ESBWR emergency coolant system does not rely on pumps. Rather gravity feeds the energency coolant water into the reactor core. The sophisticated features of the ESBWR greatly enhances its safety compared to other Light Water Reactors. The ESBWR is calculated to be in danger of core melt down once every 29 million years. One would expect that with the extreme unlikelihood of core meltdown with the ESBWR, and the success of core containment by the reactor pressure vessel in the Three Mile Island that no provision for the containment of a molten reactor core would be made in the case of pressure vessel failure. Such is the safety of the ESBWR design that provision is made for the almost infinitely slight probability of that a molten core would escape its pressure vessel. 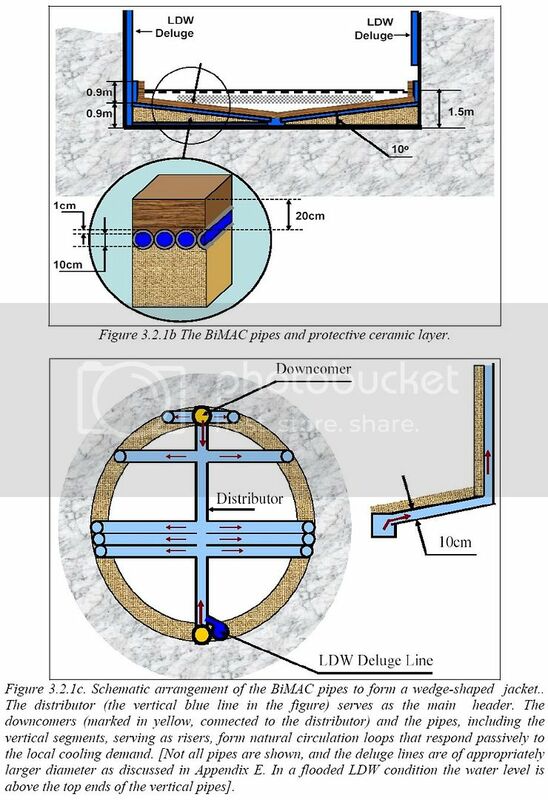 In that case a core drainage and capture system has been been included in the ESBWR reactor design. In a probabilistic world it is impossible to completely dismiss the possibility that a ESBWR Will ultimately fail in a catastrophic accident that will cost human lives, but the sun will also fail costing the life of everyone left on earth, and in a somewhat similar time frame. Thus the advanced safety features of the ESBWR coolant system, coupled with standard reactor defenses in depth against radiation releases, and a very advanced molten core capturing system, render concerns about ESBWR safety irrational.